Fun and friendship is the cornerstone of the Beaver Scouts programme. Beaver Scouts opens the door for your child to discover the world. It is filled with a little bit of everything – outdoor activities, games, music and sports. Along the way, Beaver Scouts meet new friends, learn cooperation and teamwork and develop self-confidence. 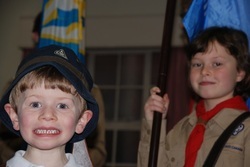 Beaver Scouts are welcomed into a group of energetic boys and girls just like them. They will meet with kind and caring scouters that will help them with anything they need to know about being a good Scout. They will feel respected and appreciated for their own uniqueness, and encouraged to bring all they can to their group and activities. The 65th Toronto Beavers go on a fall and a winter camp, both in cabins. Many of the children who started in Beavers have gone on to be Cubs, Sea Scouts, Sea Venturers, and Sea Rovers. Weekly Beavers meetings take place Thursday nights at from 7-8 p.m.